I have had weddings on the brain lately. My childhood best friend recently asked me to be in her wedding, and two of my cousins just got engaged over the past weekend. (Another cousin had a baby, and we had a family reunion. It was a big week for our family!) I am designing invitations for two of these weddings, and I am so excited. These are people that I’ve grown up with, and I hope that some of the affection I feel for them will come through in my designs. Luckily, the internet is full of inspiration. Below are a few of my favorites. Please click through the photos to see more pictures on the original blogs. 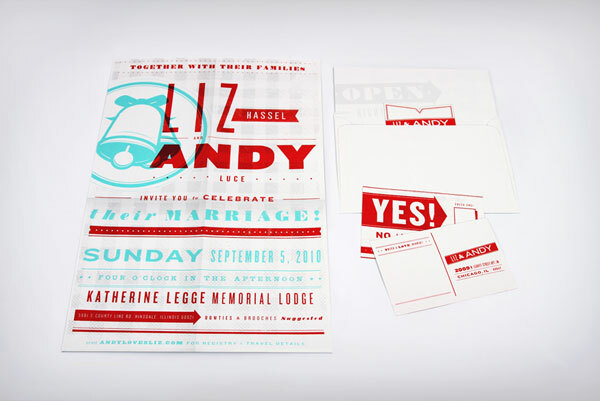 This is just a gorgeous invitation suite. Click through to see the whole thing. I love the simple color palette, and the restrained design. Also, you can’t go wrong with kraft paper, it seems. The teal and red color combination is one of my favorites right now. I know that this wouldn’t be for everyone, but I love how bold and graphic the suite is. The transparent ink is such a subtly beautiful touch. You should really just go poke around Oh So Beautiful Paper. So many of my favorite invitations come through that website, it was a struggle to only post two from their blog. My takeaway is that I really need to learn calligraphy like, yesterday, and I think the vintage stamp look is my favorite trend right now. Who wouldn’t love to receive a nice big envelope covered in beautiful stamps? Monsters, that’s who. I couldn’t resist sharing one of my own projects! This suite was entirely handmade, and a true labor of love. 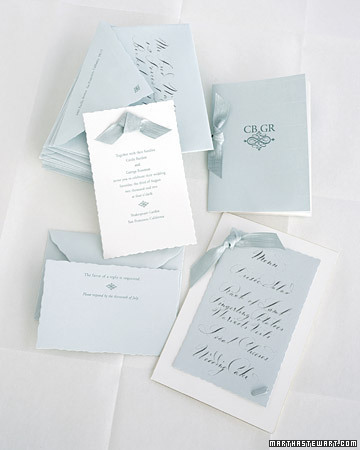 I lettered every invitation and program, and paired that with a watercolor wash, edge painting, and brightly colored envelopes. Finally, I’d like to show an inspiration from Martha Stewart. She is basically my homemaking hero, (it was definitely the highlight of my month when I was 10 years old and her magazines would arrive in the mail… nerd alert!) and of course her wedding stuff is also beautiful. My cousin sent this to me when we were brainstorming for her wedding invitations, and I have to say I love the simplicity of this. I think sometimes it’s easy to get caught up in making the best, most special, most intricate invitations ever, but this tone on tone, calligraphic beauty is breathtaking in its simplicity. In closing, if you need invitations designed, get in touch! I have a lot of ideas.